Dave’s family is famous for the delicious homemade maple syrup, jams, dill pickles and relishes they give at Christmas and this year we thought we’d add a little DIY to our gift-giving. Our holiday goodies for 2011: spiced pecans and caramel popcorn. I found the recipe in the Chef Michael Smith’s Kitchen cookbook and thought it looked tasty and easy enough to make. Which is true, it is easy to make – melt butter, pop corn, add icing sugar and a dash of salt. The tricky part, though, is finding the just-right temperature (and timing) to achieve that deep, rich caramel colour. Our kitchen was like a candy factory this week as I made five batches of the stuff (actually, technically, it was 10 batches since I doubled the recipe each time). The first two tries were too light – the kernels were sweet, but kinda whimpy tasting. I burnt the third batch (burner was set too high at 6). Gun shy, I turned the burner down to 4 for the fourth batch and, again, the results were bland. I got brave by the fifth batch and cooked the candied corn at level 5 and I am proud (and relieved) to say that I finally achieved that gooey caramel-y colour. I threw the previously cooked, too-light kernels back onto the heat and watched their colour deepen from lightly toasted to (almost) perfectly caramelized. 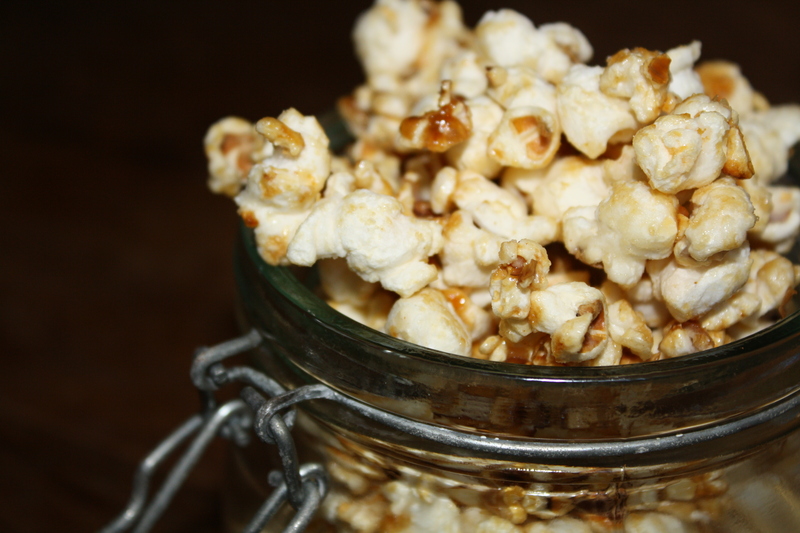 This entry was posted in Food and tagged caramel popcorn, chef at home caramel corn, chef michael smith's kitchen, homemade caramel popcorn, michael smith, michael smith caramel corn recipe, michael smith chef at home by lovewritenow. Bookmark the permalink.